Rhys Goldstein, Simon Breslav, and Azam Khan. 2013. Informal DEVS conventions motivated by practical considerations (WIP). In Proceedings of the Symposium on Theory of Modeling & Simulation - DEVS Integrative M&S Symposium (DEVS 13). Society for Computer Simulation International, San Diego, CA, USA, , Article 10 , 6 pages. 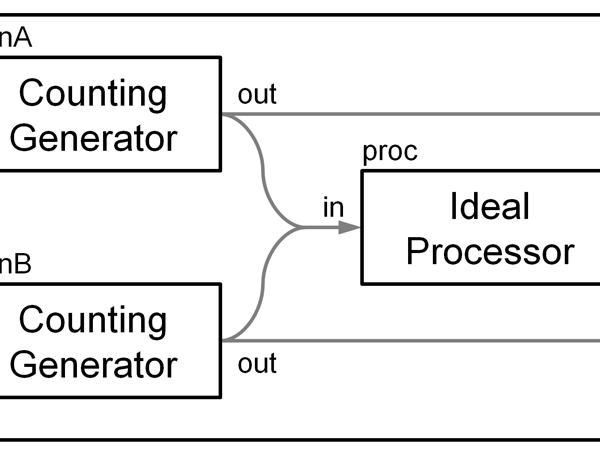 The formalism known as the Discrete Event System Specification (DEVS) provides a set of mathematical elements for modeling time-varying systems. When DEVS is applied in the form of an executable representation, however, some deviation from the formalism is unavoidable. By proposing a set of informal DEVS conventions, we show how certain changes to the formalism, some previously adopted, others less explored, may help simulation tools appeal to users who stand to benefit from DEVS theory but are more cognizant of practical issues. Our conventions use parameters and statistics to encapsulate the state of an atomic model and the composition of a coupled model. They also include changes both to transition functions and the ordering of simultaneous events to promote convenience, efficiency, and reproducibility.